Los Angeles, CA – As a participating gallery in the Getty’s region-wide endeavor, Pacific Standard Time: LA/LA, Jack Rutberg Fine Arts presents Hans Burkhardt in Mexico at its gallery located at 357 N. La Brea Avenue in Los Angeles. The exhibition features major works painted in Mexico by the Los Angeles artist, Hans Burkhardt, over a span of more than 10 years beginning in 1950. At the time of Burkhardt’s first visit to Mexico, he was among the most widely exhibited artists of L.A.’s avant-garde, including having been the subject of a solo exhibition in 1945 at the Los Angeles County Museum. 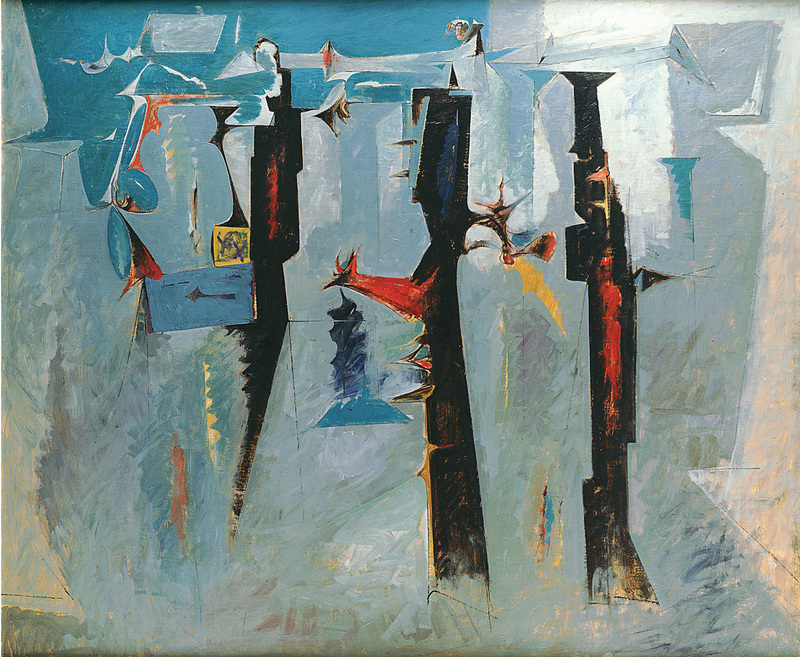 Arriving in Guadalajara in 1950, Burkhardt’s unique expressionist sensibility distinguished him from other artists, however Mexico’s culture and environment proved critical in Burkhardt’s own development. Upon his arrival, Burkhardt – a modernist – was confronted by an ancient culture of contrasts, stating: “Everything was old, antique…What can I paint? I decided I had to study their culture…I painted the soul of Mexico...that there was something better thereafter”. Mexico’s contrasting architecture and sensual landscape made its impact on Burkhardt. He was particularly moved by its innocence, beauty and its culture with which he resonated. Even the hardship of local peasants was something with which Burkhardt had considerable empathy, given the deprivations of his own youth in his native Switzerland, before coming to the U.S. in 1924. The mystical reverence of the peasants he witnessed during what seemed to be endless funeral processions affected Burkhardt profoundly, resulting in poignant paintings he referred to as “Burials” and “Journey to the Unknown”. 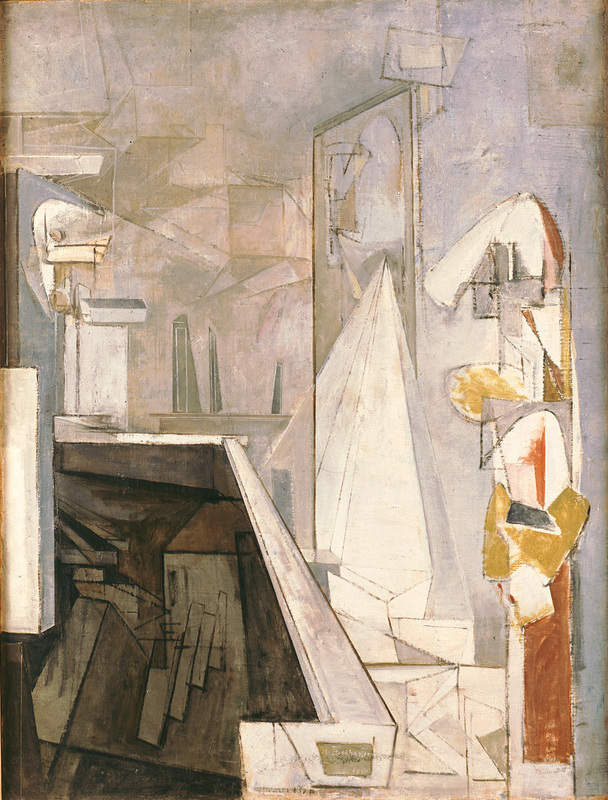 Among his first paintings were several versions of “Burial of Gorky” (his friend had committed suicide two years earlier) painted in 1950; one exhibited at the Metropolitan Museum in New York that same year. 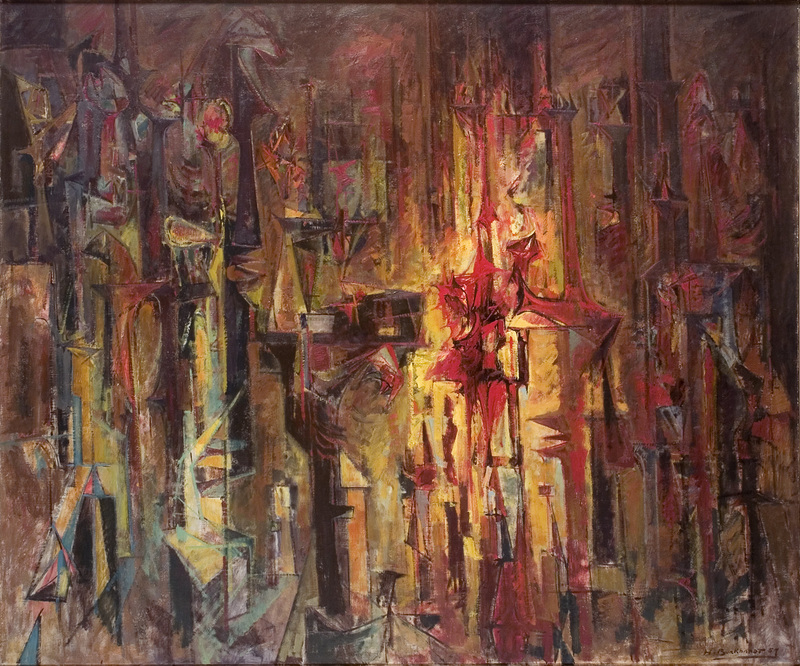 Hans Burkhardt in Mexico includes paintings that combine these elements of architecture, ritual and spirituality in an extraordinary manner in masterpieces such as his 1957 painting, “City at Night (Guadalajara)”. Needing to return regularly to L.A. to renew his visa, Burkhardt would be received with exhibition offers in L.A. despite its general hostility toward abstract art at that time. He was also included in museum exhibitions throughout the U.S. and was probably the most widely exhibited artist of L.A. with 23 solo exhibition and 30 museum group exhibitions between 1950 and 1960 alone. Upon returning to Guadalajara (residing in Zapopan, a nearby town) in 1951, he was honored with a solo exhibition at the Museo Bellas Artes, Guadalajara. 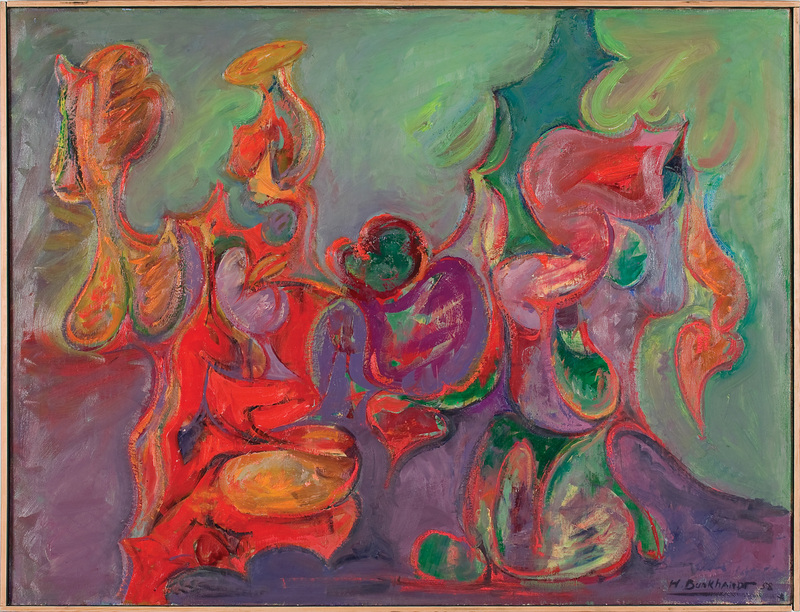 Still deeply impacted by his friend Gorky’s death, he would paint two versions of “Studio of Gorky” in 1951; one shown at the Whitney Museum in New York that year, and the other is included in this present exhibition, Hans Burkhardt in Mexico. In 1956, Burkhardt was the subject of a one man show at the Instituto Allende, in San Miguel de Allende. In 1958, working in San Miguel, famous for its 16th and 17th century architecture, churches and bells, Burkhardt reflected upon the constant ringing of the bells marking the times of day and religious processions, which took on symbolic meaning. Burkhardt knew that they often rang, as he stated, “for the one who could no longer hear them”. The result was Burkhardt’s distillation of the Journey into the Unknown to its most distilled and ephemeral development of his “Silent Sounds” series he continued through 1960, when the Instituto Allende gave Burkhardt his second solo exhibition at that institution. The power and poignancy that Hans Burkhardt conveyed in his paintings resonated strongly in Mexico, and some made reference to Burkhardt as a great Mexican master. Among his lifelong admirers was one of Mexico’s greatest painters, Rufino Tamayo. Hans Burkhardt was born in Basel, Switzerland in 1904, immigrating to New York in 1924. There he was associated with and shared the studio of Arshile Gorky, before moving to Los Angeles in 1937, representing the most direct link between Los Angeles and the New York School. He resided in Los Angeles until his death in 1994. 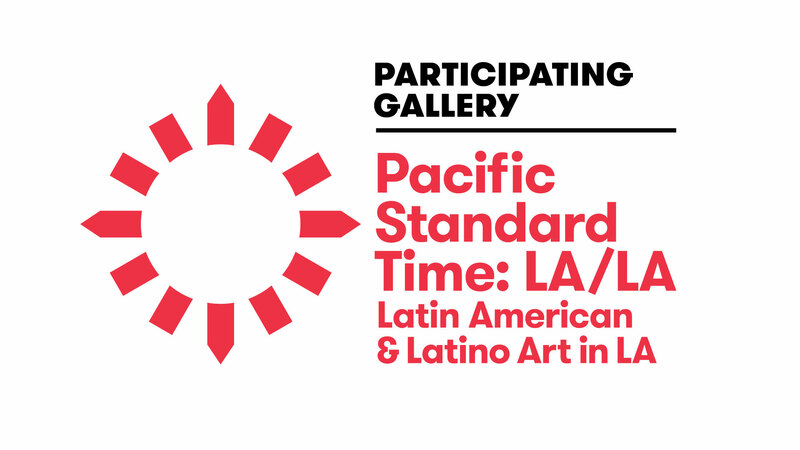 No other artist of Los Angeles was more associated with Mexico than Hans Burkhardt with the exception of L.A. artist Rico Lebrun, who will be featured at Jack Rutberg Fine Arts, opening January, 20, 2018 as one of its exhibitions as part of Pacific Standard Time: LA/LA. Concurrent with the Lebrun exhibition, the gallery will also present Francisco Zuniga – Indigenous Beauty; works by the celebrated Mexican artist, also claimed by his nation of birth, Costa Rica. On October 28, 2017, concurrent with the Burkhardt exhibition, the gallery will present an exhibition featuring the collaboration of legendary filmmaker, George Romero, and his lifelong friend, artist George Nama; Romero’s recent work – a short story written for Nama, and the body of artwork by Nama in response. Hans Burkhardt in Mexico extends through December 23 at Jack Rutberg Fine Arts located at 357 North La Brea Avenue in Los Angeles. Gallery hours are Tuesday through Friday from 10:00 a.m. to 6:00 p.m., and Saturdays from 10:00 a.m. to 5:00 p.m. For further information phone: (323) 938-5222 or email jrutberg@jackrutbergfinearts.com.